Serve burgers 3 times a day, 7 days a week and my kids won’t complain; put daal (lentils) on the table twice a day and watch their appetite gone. Does this happen in your house? The main problem I face on a “burger day” is that there are no gf burger buns available in the market. I am struggling at making a fine gf loaf of bread or buns mainly because we don’t have all sorts of gf flour blends that we see on gf sites. I’ll try to share this sad side of being gluten free in Pakistan some other time In Sha Allah. I had a good amount of extra lean minced beef and couldn’t think of anything but a thick, moist and flavourful burger patty. For this recipe, I kept seasoning to a minimum and used mozzarella cheese to let the Peri Peri sauce standout. In a food processor combine minced beef, garlic, onion, rice flour, salt, black pepper powder, red pepper powder, allspice powder and nutmeg. Process till mixed well. Transfer into a big mixing bowl and add beaten egg, mix well. Heat a grill pan and drizzle some cooking oil on it. Shape minced mixture into round and thick patty; place on hot grill pan. Let it cook completely before flipping, about two-three minutes depending on the thickness and size of the patty. Flip and cook the other side. Place a slice of mozzarella on the cooked side to get it all melty. Remove from the grill pan. 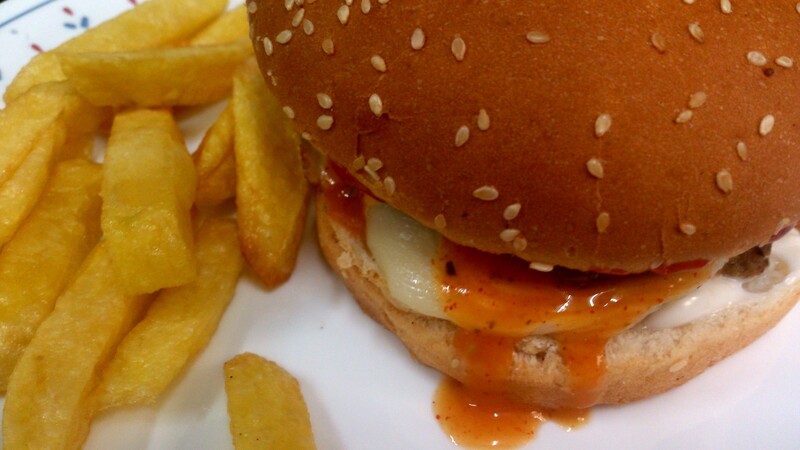 For assembly, spread a layer of mayonnaise on the bun, add some lettuce, place the patty, pour Peri Peri sauce as much as you like, some pickle and ketchup. Serve hot with fries. Yes, that always happens in my house too :). Looks delicious! Lovely and yummy recipe. Could do this over the weekend! Thank you so much 🙂 would love some feed back. Yep it’s an issue. A lot of junk food has chemicals in there to make you wana eat more. Wow Looks delicious! Burgers vs Dhal… Dhal=1, burgers=0.. Dhal is a lot healthier and with all the spices, tastier.. Think I’ll be making some tonight! I think when they’re older,your children will appreciate traditional food when they’re older! The great thing about home cooked meal is that you can make anything healthier. True. But the meat has to be a better quality, as well as the vegetables etc. Dhal is good, and full of fibre,protein and small amount of carbohydrates. I took a break from meat recently..